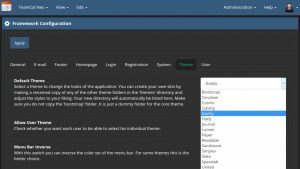 TeamCal Neo 2.1.0 is out! Version 2 now includes the new Font Awesome 5 with all its 1480 icons. Please read the Upgradeinfo.txt file in the ‘doc’ folder. Also, GDPR is driving us nuts. 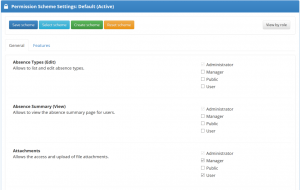 TeamCal Neo 2 now offers a configurable proper data protection policy. On top in version 2.1 a much better Log entry search has been implemented. Check out the new release! 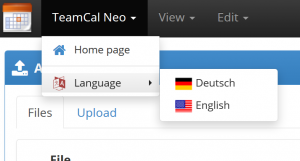 TeamCal Neo is the successor of the popular TeamCal Pro. It has been completely re-written as a responsive web application based on HTML5 and CSS3. It uses modern frameworks like PDO, Bootstrap, jQuery and Font Awesome. 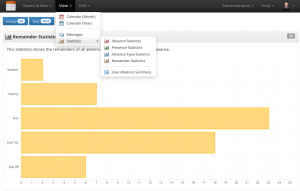 You will find all important TeamCal Pro features in a great new modern design. TeamCal Neo is a web-based application utilizing PHP and a MySQL database. 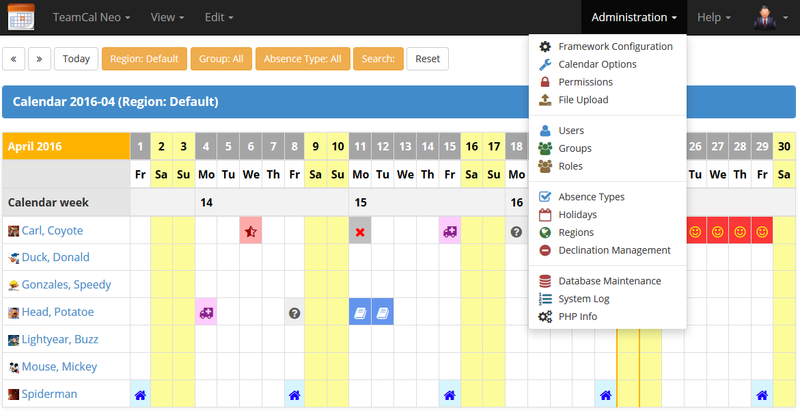 It’s generic purpose is the day-based absence management of project teams and other groups needing absence scheduling. The goal was to create an attractive but also modern and effective representation of a calendar display, showing the presence and absence of each team member. 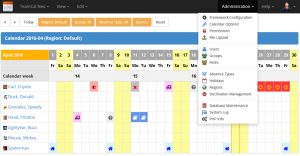 TeamCal Neo supports the customization of holiday types and absence types, thus its purpose can be altered to any graphical representation of timeline based processes or activities, e.g. a simple project plan or an event management. TeamCal Neo is a free open source application. You can use it at no cost in any non-profit environment. 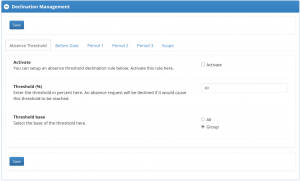 The administrator can create and configure absence types. 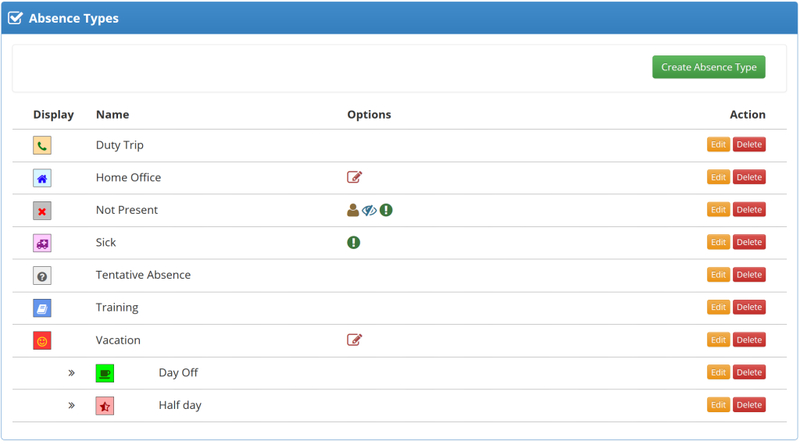 Besides a one-letter code, icon and colors he can define thresholds and allowances per absence type. 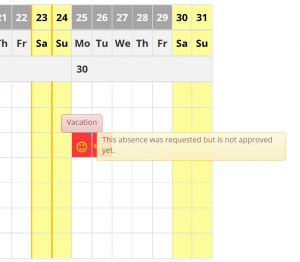 Absence types can also be restricted to certain groups only. Each absence type can be assigned a Font Awesome icon. You can select from over 400. This icon is then displayed in the calendar views. 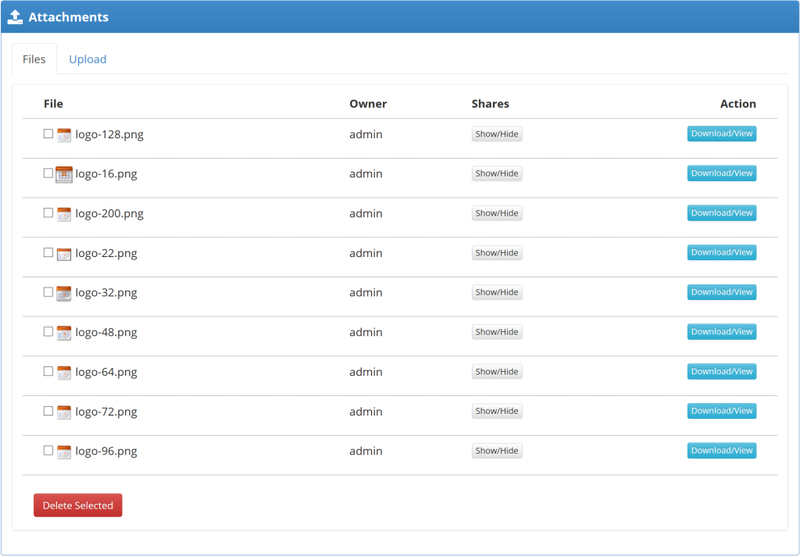 It’s color can also be configured. 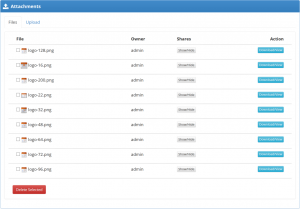 TeamCal Neo allows to upload files and share them with other users or groups. 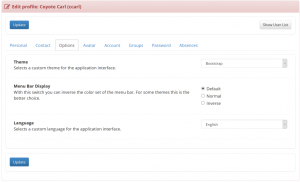 A comfortable menu offers a very convenient way to navigate through the many features of the application. You can define notes for each day of the calendar like holidays, events, anniversaries and such. But also personal daynotes are available. A daynote is indicated by a little marker in the according cell. Moving the mouse over that cell will reveal the note in form of a tool-tip. Based on thresholds of a maximum absence percentage per group the Declination Management provides approval capabilities to group managers. 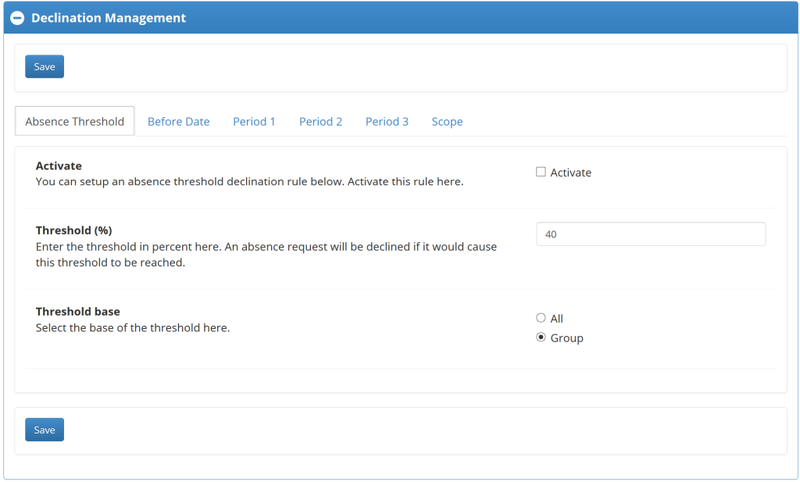 You can also define periods in which absences will be declined. 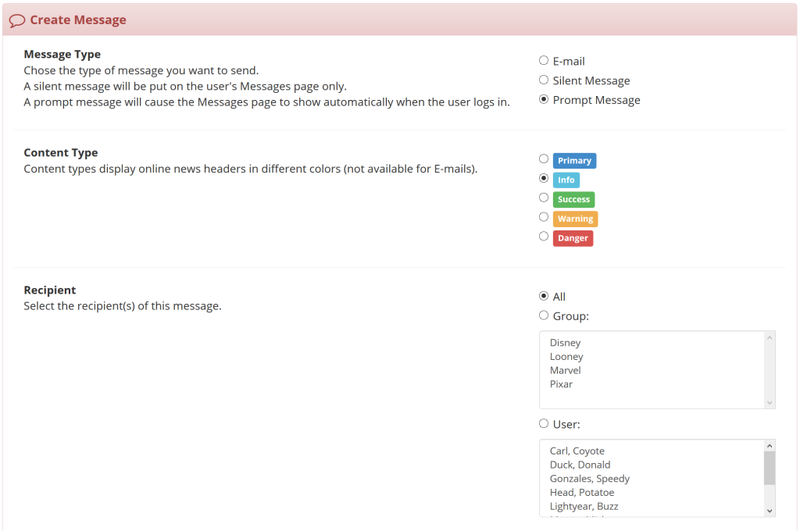 Each user can be assigned to a group. The groups can be defined by the administrator. A user can be a simple member of a group or can be the manager of that group granting him certain additional rights. 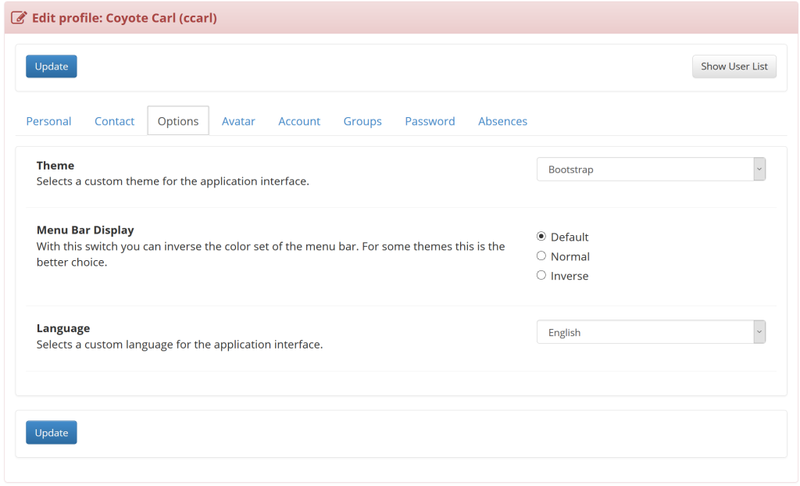 Roles can be used to grant different permissions in TeamCal Neo. 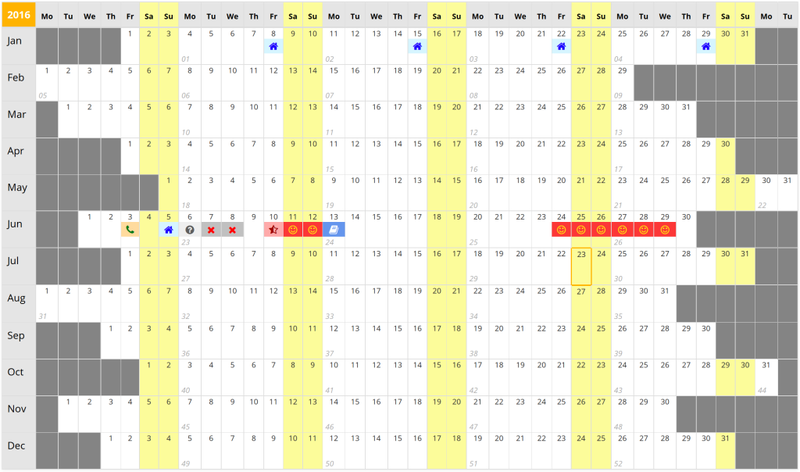 Holidays and other region related events can be configured and displayed in the calendar. 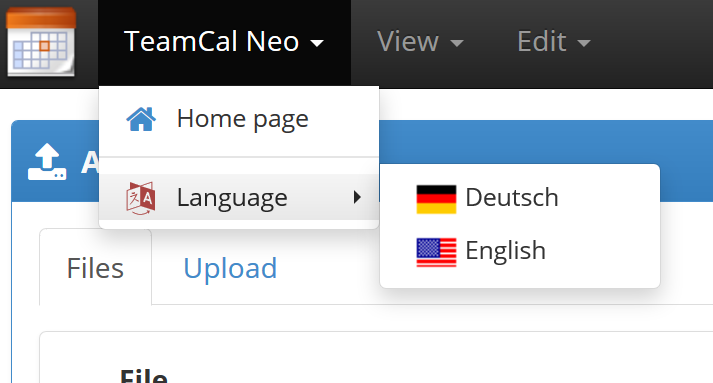 TeamCal Neo supports multiple languages. It comes in German and English. You can create your own language files to add yours. 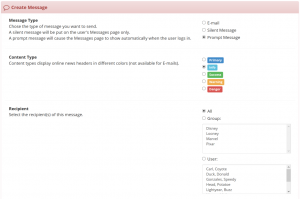 Users can communicate with each other via the message center. Decide whether you want your message to pop up the next time the receiving user logs in or whether you want it to be sent to him via eMail. Who can do what in TeamCal Neo is defined by permission schemes. 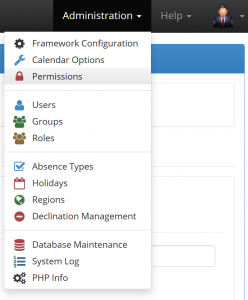 You decide what permissions you want for each role you have configured. Each permission combination can be saved as a permission scheme so you can quickly switch between them. 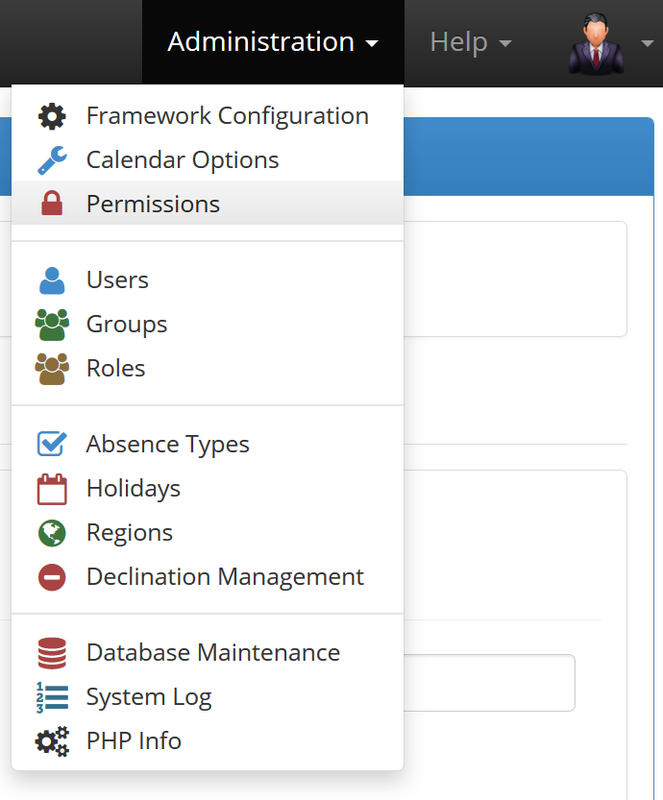 You can configure regions to display region related holidays and other events. 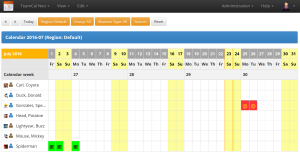 Consider it as a calendar template that users can chose to view their absences in. Beautiful statistics offer details about abesences and presences. That way managers can get an effective graphical overview. 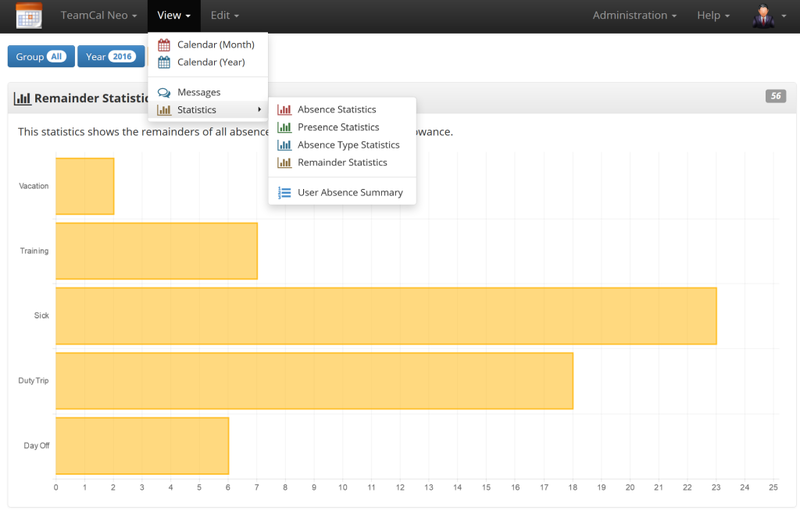 A detailed and configurable log shows you everything that users do, add or change. 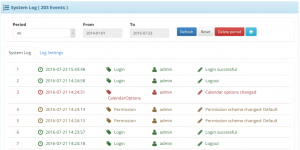 The user management gives you control about your calendar accounts. 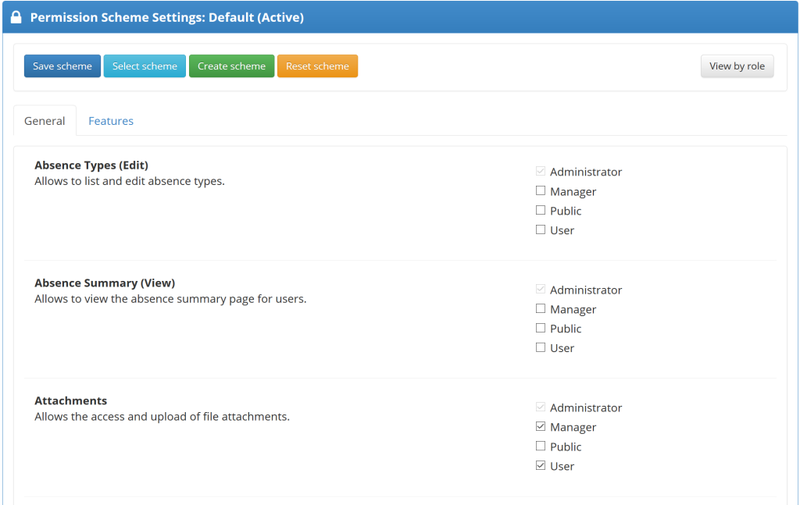 You can even archive them including their settings for later reactivation. 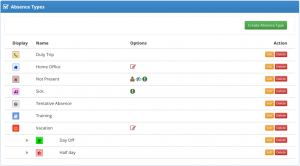 A wide variety of options are available for the administrator and the users themselves to configure their profile. Besides of the month-based view you can switch to a year view for each user. 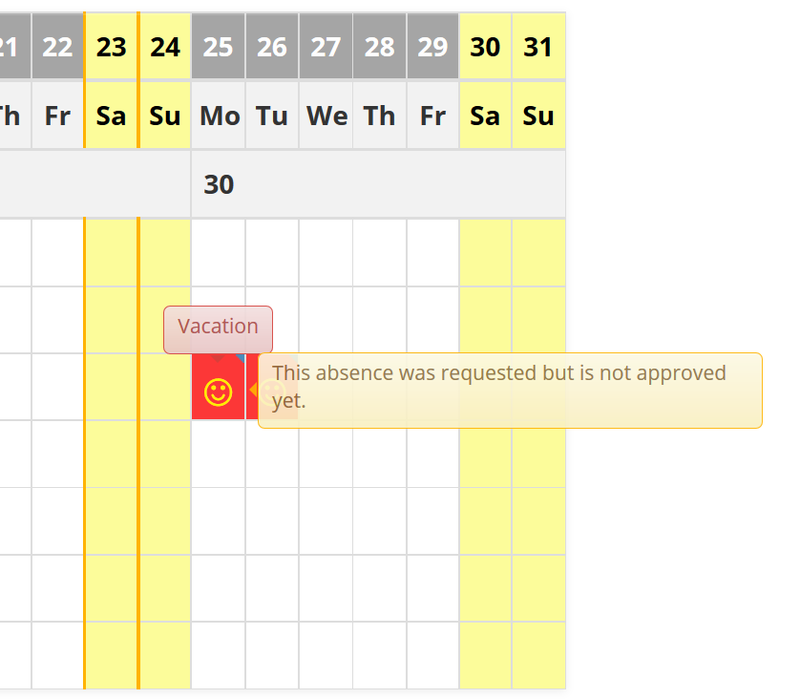 In one glance you will see all absences of that user throughout the year. 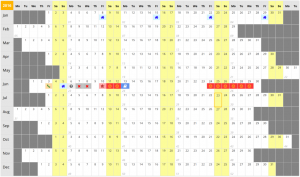 This is very helpful to see how certain blocks of absences are spread over the year. The TeamCal Neo source code and download packages are hosted on Bitbucket.